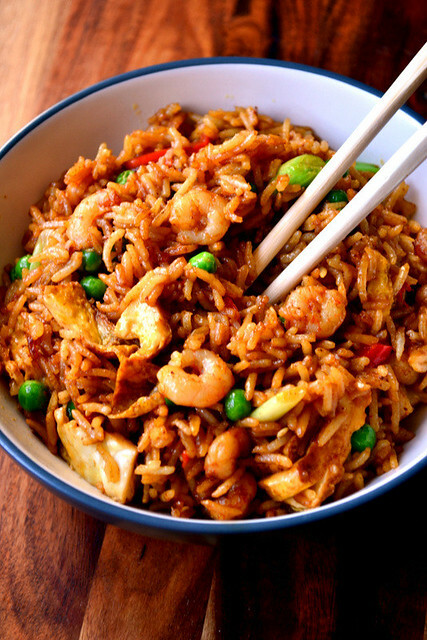 A twist on a noodle dish of the same name, Singapore Fried Rice is a fast food classic often featured on Chinese takeaway menus in Britain. Spicy and full of fresh ingredients, it may have little to do with Singapore, but it makes tempting comfort food. Indeed, it would seem that Singapore fried rice is something of a misnomer; it has nothing to do with the city state. Still, things could be worse and far be it from me to go about changing the name of a delicious takeaway meal. It’ll sit beautifully beside your chicken chow mein. 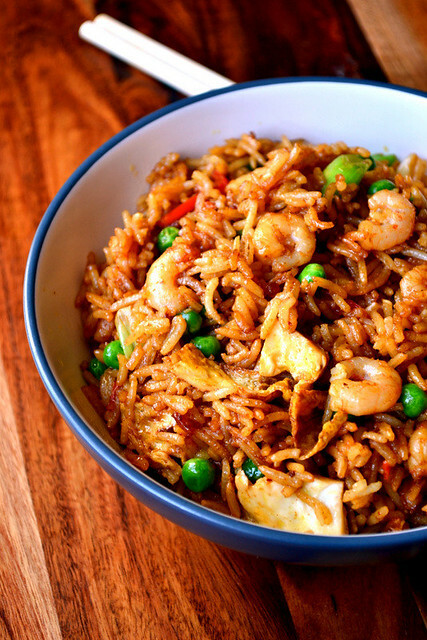 Like all fried rice dishes – my recipe for egg fried rice, for instance – Singapore fried rice is an excellent way of using up leftover boiled rice. But unlike most uses for leftovers, day old rice is an absolute requirement. Boiled, left to cool and refrigerated, rice loses much of its sticky starch and moisture, leaving you with a grain that’s easy to work with. This is the type of dish you could easily get fancy with, but things are better left simple. When choosing your prawns, for instance, sidestep the king prawns and make a beeline for the smaller varieties, usually found in frozen aisles at the supermarket. Having said that, you may fancy a little extra protein. Should your fridge contain leftover chicken, or even a thigh you can quickly roast up, shred it and throw that in too. Chicken works beautifully with this moreish bowl of spicy fried rice. Heat 1 tbsp of sunflower oil in a small frying pan. Flash fry the prawns, spring onions, garlic and chilli. Set aside. Gently whisk the egg, fry in a little oil to make a simple omelette. Roll and slice into 1cm strips. Heat the remaining sunflower oil in a wok until smoking. 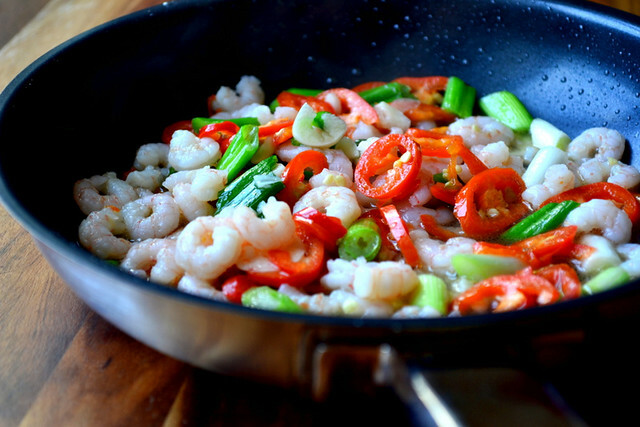 Add the prawns, spring onions, garlic and chilli, followed immediately by the rice and peas. Grind your clove and star anise. Add to the mix along with the chilli powder, turmeric and garam masala. Ensure everything is incorporated, including the omelette, before seasoning the rice with the soy sauce and sesame oil. Serve immediately. 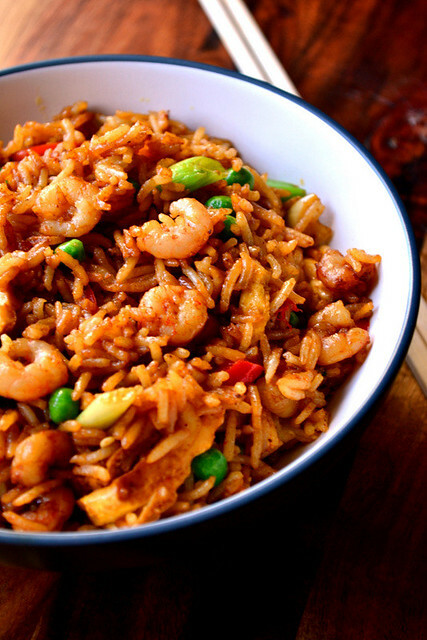 Cost: Using less expensive varieties of prawns and few ingredients of expense, this comforting meal for two should set you back under £1.70. I guess I am boiling a pot of rice today. Great recipe, my family will love it! I hope it went down well! I managed to make it too dry somehow. Next time I’ll add some pineapple. But otherwise it was great! How strange! Still, I’m glad you enjoyed it. Nice. I don’t usually add these types of spices to fried rice but know I must! Sounds fantastic. Oh this looks delish! Love the spices you’ve used here, so flavorful. A perfect weeknight meal! Thank you, Karista – you’re right, it’s great as a quick meal. I really like this recipe – one of our family favourites for leftover rice is eggy rice, so it would be great to try this as an alternative! Thank you – I also make eggy rice, but this changes things up a little. This looks delicious! 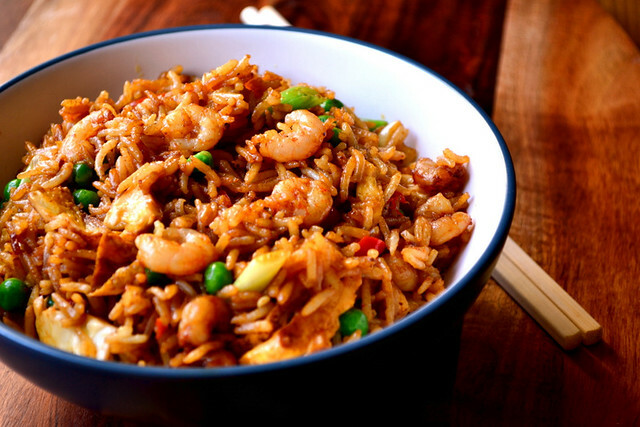 I confess to being a complete rice addict – I could happily eat it three times a day, every day, in some form or other! 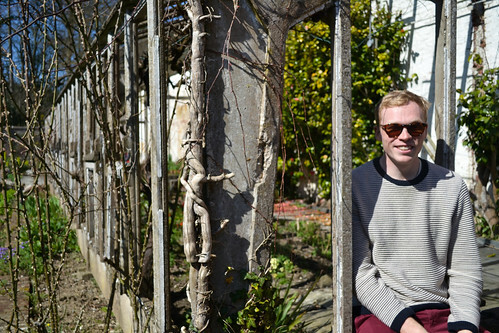 Me too – probably the most comforting, moreish carb? It’s hard to say. Potato is awfully nice. I think so – probably because it is so versatile, savoury or sweet (hmmm, rice pudding!!). I have to be in the mood for potato, whereas rice . . . whenever, wherever! Oh yes, it’s all about rice pudding. Have you seen my recipes for it? Love Singapore Noodles – I am looking forward to trying this rice version! And crispy beef, and pork satay, and . . . I can’t get enough of making my own homemade takeaway classics. A very nice twist on the noodles. Delicious. And gluten free as someone else pointed out! I hadn’t even thought of this – what an excellent point! Am probably not reading the recipe well, but what are the “precooked ingredients” in step 3, other than rice and omelette? If the omelette, I guess it could have gone in later as it will only serve to cook the egg even more when it goes into a heated wok. The prawns and the spices do not count as precooked either? Apologies for not being clear enough, I’ve amended the recipe accordingly! Many thanks and apologies for nit-picking, but I just could not figure out what was precooked. Importantly, I omitted to also issue a big thanks for your blog which I visit regularly, enjoy much, and cook even more from. The amount shown at the bottom of a recipe really thrills me to no end, as it then puts a benchmark for my own cost. As you say in this recipe, the dish can easily get fancy, but when I make one of your recipes the first time, I stick to it fully in order to approximate the cost. To eat frugally re cost but grandly re taste really is such a thrill (and sometimes so difficult to achieve – all the more fun when it works). Singapore fried rice is on the menu for tonight! Thanks! Yes! Of course – I’ve actually made it with noodles myself. sounds lovely this, will be giving this ago over the weekend. Thanks for posting. Turned out very well, I replaced prawns with cooked chicken breast cut into slices. Love Singapore fried rice! Just made this and it was excellent!